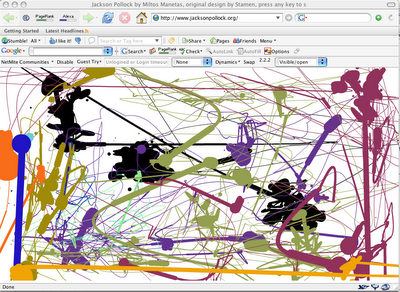 Fashion Style: JacksonPollock: Paint By Mouse! 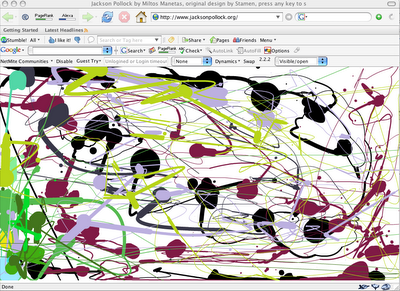 Just saw this on DailyCandy - splatter paint your screen on JacksonPollock.org by Miltos Manetas, wth original site design by Stamen! It's just like making a super nova on the Debt-O-Meter, but with pixels! A great way to relax the mind if you need to shift gears and freshen up your brain. Unleashing your inner Pollock is super easy. No sign-up is required. You just hit the website and the painting has begun! In other words, bookmark. First attempt. The colors change with each click of the mouse. The mouse works just like a paint brush. The faster you go, the thinner the line. If you linger, you get a plop of paint. Second attempt. I call heem "Lasso"
It's fun to leave a JacksonPollock.org window open on your computer so that when you are clicking through your windows, or are moving between programs, you accidentally make a couple of brush strokes. At least, that's what ends up happening with my Mac.